Apart from all the fantastic business benefits of GPS Fleet Tracking, it can also have the effect of improving your driving behaviour. A key part of establishing that improved behavior is to set standards for your drivers to reach. Geotab GPS Fleet Tracking devices produce easily understood data to support your program. Using the information, you can check in on drivers’ behavior regularly, and establish areas of improvement or take corrective action. In this post, we’ll take a look at how some real-world companies have established and met improved driving standards among their vehicle operators. But first, let’s recap some of the business benefits to improving your drivers’ behavior on the roads. Lower costs relating to vehicle accidents, and ongoing costs stemming from collisions. Lower fuel costs as a result of less aggressive driving behavior. Reduced maintenance costs, and a possibly longer lifespan for your vehicles. A better image for your company on the roads. Depending on circumstances, the possibility of lower insurance rates. 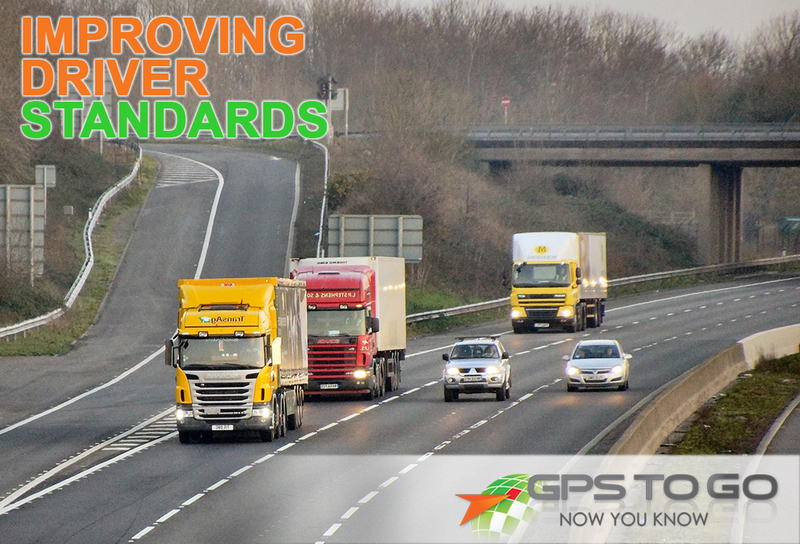 There may be any number of standards which you may wish to improve amongst your fleet of drivers, both to improve driver safety, and to improve efficiency as well. Some common benchmarks that fleet managers use GPS vehicle tracking to improve on are as follows. Reducing Idle Time: Geotab provides data on each driver’s idle times; knowing that it’s being monitored, your drivers will reduce the time they spend idling their vehicles – and wasting the company’s money. Reducing Speeding Incidents: Geotab gives you the capability to set audible in-cab alerts to alert your drivers when they are speeding; there is also a Speed Report on the MyGeotab platform that’s easy to pull, and gives you a clear breakdown of each driver’s speed tendancies. Off Hours Use of Vehicles: The MyGeotab platform provides easy-to-access Off-Hours Vehicle Use Reports. If your organization has its employees take their company vehicles home, there will be no more questions about how they’re using it while they’re not on the clock. Reduce Overtime Hours Paid Out: As a result of the improved efficiency that many companies see in their employees after implementing GPS tracking, your employees may reach more customers in the same period of time, making for a reduction in overtime work. So, once you’ve established what you’re looking to improve on, how do you use Geotab to put the plan into action? The first step to establishing improved standards is to open the lines of communications with everyone in the chain of command who can play a role in the chain. Getting everyone in your organization on board is crucial to improving your drivers’ metrics. Next, you’ll have to establish a baseline of where you’re currently at. Whether that means running some calculations based on the information you have, or using the early days of your telematics data to establish your current situation, will depend on your company’s existing record keeping and particular needs. Once you have some data about the current operations of your fleet, you can set benchmarks for improvement. Finally, follow-through is crucial. Through the industry-best MyGeotab platform, assessing data is so easy, even if you have very little computer skills. With regular monitoring and communications with drivers regarding the standards you’re looking to improve, you’re very likely to see success. For some organizations, that change happens almost overnight. Here’s a transportation and logistics company that established increased driver standards around the same time they decided to implement GPS tracking devices in their fleet. They saw a 20% reduction in their accident costs, and several other operational benefits. This landscaping company went into a pilot program with their insurance carrier to monitor and review data, in an effort to reduce insurance costs with GPS. The company regularly monitored the data, and took corrective action with drivers who were not meeting their standards. Infractions went down, speeding was reduced, the company’s trucks had less wear-and-tear, and the telematics information has allowed the organization to accurately project fuel costs, among other benefits. A security services company with 800 vehicles on the road wanted safer driving in their fleet, and for their drivers to always wear their seatbelts. By monitoring data, they were able to open communications with their employees about using safer driving habits. The results were amazing. Making use of real-time alerts, reports, and communication with drivers, the incidents of drivers not wearing their seatbelts went from 250 occurrences in the first week, to zero in the next. As well, in one region, the improved driving standards had the incredible effect of reducing accidents by 80%. There’s no better way to see the ways that GPS Fleet Tracking can improve your business’s operations, driver safety and bottom line than to test it for your own company. GPS to GO makes it easier than ever with our $50 GPS Vehicle Tracking Trial Offer. It works like this: we’ll send you the plug and play devices to test on your vehicles. They install in seconds and you’ll be up and running in a flash. There’s no obligation, no hassle, and no contract to sign – it’s yours to test for your business. When you’re ready to purchase, we’ll credit the $50 to your account. Get a fleet tracking quote, or just get rolling today with Geotab fleet tracking.